The Chimney Bird Incident in 2002 sparked a strange fascination with dead birds…there is something so tragic about having the power to command the skies, but still being vulnerable enough to fall from them (I suppose one could call this an Icarus Complex…yes, he fell because he flew in the face of the Gods, so to speak, which is a bit different, but it’s still the same idea). 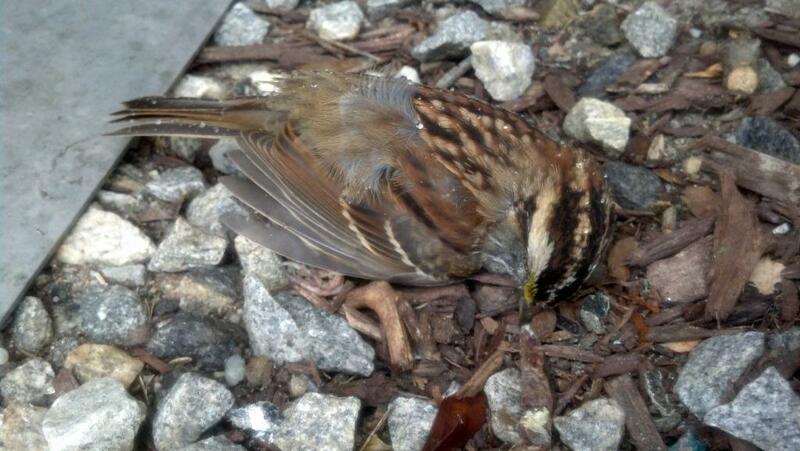 Fortunately, I don’t see many dead birds, but when I do, I photograph them. Here is my gallery so far; descriptions follow the photographs. This little guy fell from the sky and then was run over by a car in the Bronx Zoo parking lot. The picture is of poor quality because this was back when I was still using a print camera, and the subsequent conversion to digital washed out the image. This white-throated sparrow (you can tell by the black striping on the crown and the small spot of yellow near the eye) was outside the Fed-Ex pick-up box outside my office in Danbury. The upper floors of the building are flanked with wide concrete ledges—perfect spots for all manner of birds to build their nests; unfortunately, the building is also almost all windows, so I’m guessing this is a glass kill. Nathan (my husband) has turned our backyard into the Audubon; we have over 12 species of birds that visit our busy feeders on a regular basis. Unfortunately, some still lose their way. 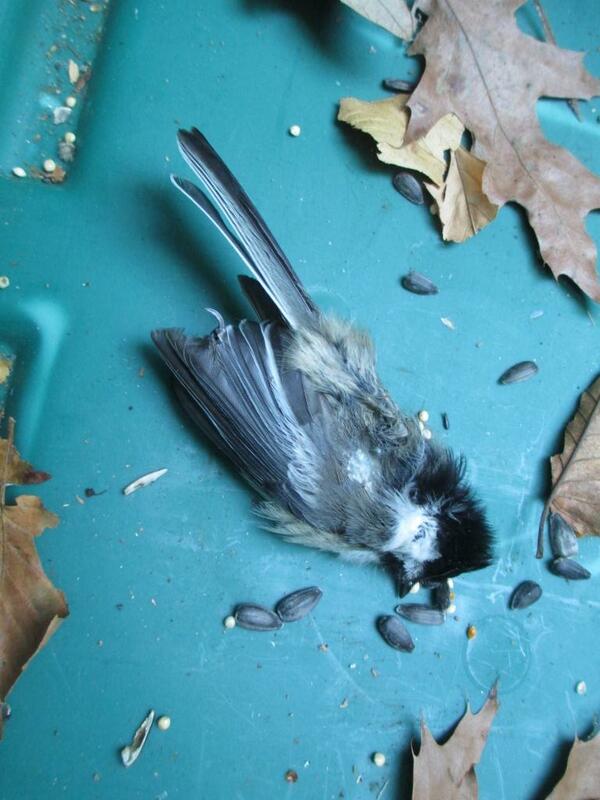 It looks like this chickadee flew into a Rubbermaid tub, which contained a couple of tarps and last summer’s outdoor tablecloth, that we had on our back porch—and then couldn’t find his way out. What was weird was his body was so light—as though every liquid and organ inside him was gone. He weighed less than a couple of sheets of paper. 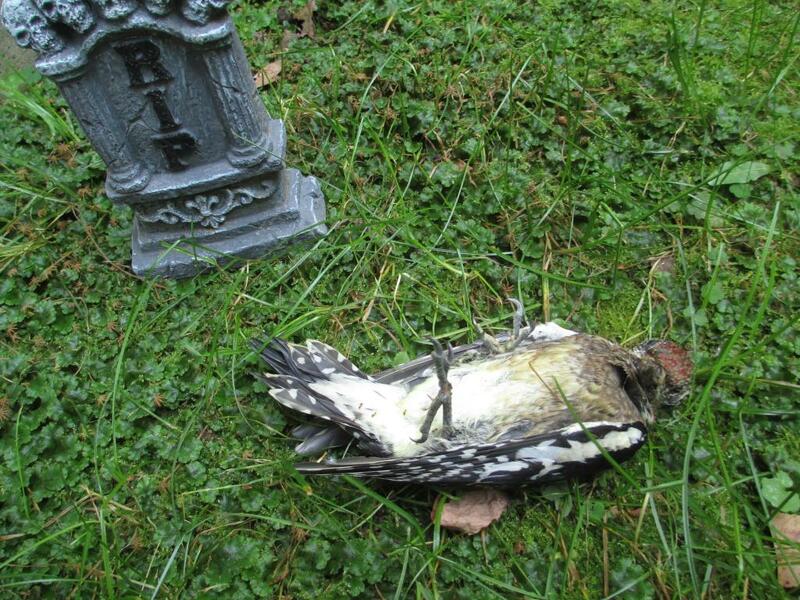 This woodpecker, which we are sure was a regular frequenter of our backyard feeders (we have two different varieties, downy and hairy), plunged to his death and landed in our decorative front yard cemetery. Because of the way he fell, we surmised he got confused, flew into the side of the house, died, and plunged to the ground below. Why he got confused, we’ll never know. There are no windows on the wall that he hit. Nathan was particularly saddened. He thinks of all the birds in our back yard as his friends. 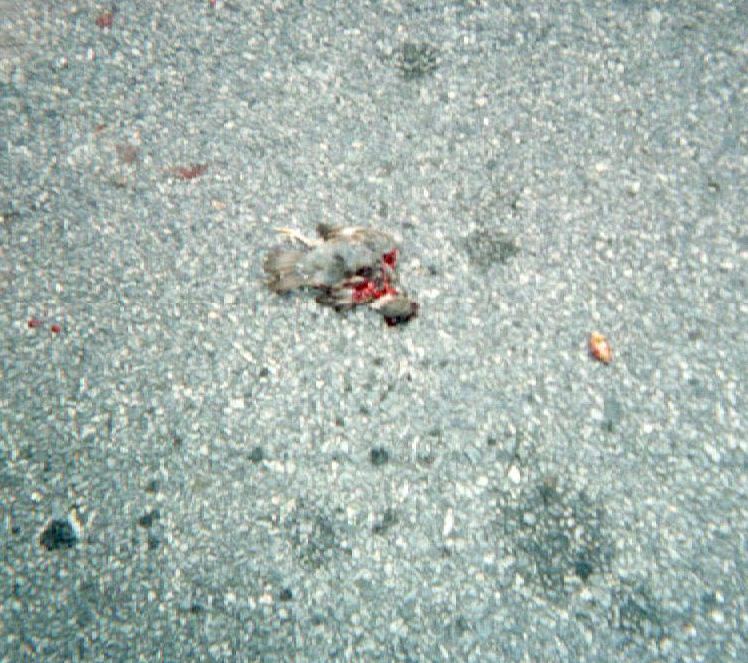 This affected me as much as, if not more than, the original bird that inspired the Winged Corpse Gallery; the pained look on this animal’s face says so much about the way it died: in the throes of desperately trying to free itself. In addition to that, I know its back story, and it begins at least a year before the bat came to me. My friends Rob and Jen had shutters on their house, and one autumn or two ago, they noticed this bat–already dead–stuck behind a shutter (you can see from the animal’s pose that one wing had gotten snagged; it probably spent God knows how long trying to break free using only the other wing). They (this is the part of the story where you can see what awesome friends I have) thought of me. The idea, at least for awhile, came and went; they didn’t remove the bat until March of 2015 (when they were preparing for spring). I stopped over on my way back from the Aquarium one Sunday afternoon and they surprised me with it. They’d put it in a plastic bag, and I brought it home and sealed it in a Tupperware with the intention of photographing it–and then keeping it, once I found the right container. I did find the right container, but then never got around to finishing it off. Finally, in July, I decided to photograph it–but when I took it out of the bag, I noticed that–like the toad we’d found in our garage (see below)–it had started to mummify. I settled for pictures and, also like the toad, will return it to the woods to let nature do its thing. My husband has attracted quite a variety of birds to our yard using different feeders; it’s one of his hobbies. We have attracted, over the past couple of years, nearly 20 species, and our feeders have, at points, hosted over one dozen birds at a time. However, that month–May of 2015–the birds mysteriously vanished, and we couldn’t figure out why. We decided there must have been some kind of predator about, and one day, when we were leaving for a weekend trip, we found this on the front lawn–a cluster of Tufted Titmouse feathers, surrounded by feathers of some other bird–a hawk or eagle, maybe; we weren’t sure. Mystery solved. On a recent taping of the “Poltergeist: Then and Now” episode of Dark Discussions, I joked that other women get flowers from their husbands, and I get dead things. Which is super awesome for two reasons: A, I have a black thumb and B, I never know what kind of really interesting present I’m going to get (when your husband’s an exterminator, there are a myriad of possibilities). Since completing my short story “Shreds of Black” for the upcoming Snowbound with Zombies anthology for the benefit of the Whittier Birthplace Museum, I have been fascinated with bees; my short story is based on Whittier’s famous poem, “Telling the Bees.” Now, a hornet is not a bee, this is true, but as it’s illegal to kill or harm bees–they have specialists who remove them to hives instead–it’s not likely I’m really going to get to look at a bee up close, so a hornet will have to do! The white powder that is all over the hornet is whatever chemical it is that’s used to exterminate them, which makes this specimen–at least to me–even more interesting. Our housemate found this in the garage when we were getting rid of some free-standing utility shelving — we think this poor toad got stuck behind the structure, and because the garage is so dry, it mummified instead of rotting. The skin feels like paper mache and the creature is quite lightweight. After taking our photographs, we moved the animal back outside so nature could do its work. This mouse was found in our driveway. This little guy was in our driveway. It’s amazing nobody ran over him. My sister hikes almost every day in the Hill Country of Texas (that’s around Austin). She photographed this on one of her hikes. I’m sure that someone with the right knowledge of Texas wildlife could ID this in a second, but I have no idea what this is. My guess is either some type of game animal related to a deer (there is such a thing as a Texas Pronghorn, but when I looked them up it appears their native populations aren’t in Hill Country). What struck me about this find was its ability to inspire both pity–where is the rest of the body? Did a hunter take it and leave the head? Or did another animal kill it and leave the head?–and fear; it reminds me of all of those creepy western landscapes in which there’s just a random deer or cow skull. When I saw this picture, the first thing I thought of was the 1970s made-for-TV feature, Gargoyles, which scared the crap out of a generation of kids–including me. 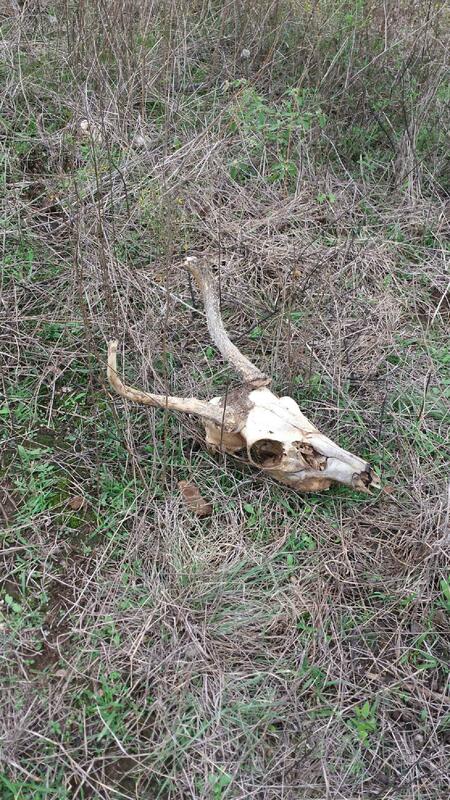 My sister found this on one of her hikes through Hill Country near Austin. The holes that you see in the photo are actually because the snake is badly decayed (and no, this was not a skin; if you look closely, you can see innards through some of the holes). Because it’s obviously been decomposing for awhile, it’s impossible to tell what kind of snake it is from just picture matching, as the body’s original colors could be significantly faded. A snake expert would probably be able to tell, but near as I can figure, it’s a snake that doesn’t have a rattle and that’s about as far as I can get. What makes this particularly stunning for me is what killed it? How did it die in just that position, in the middle of a worn hiking trail? Was it a natural death? Or did some terrified hiker come across it, step on it or kill it in fear, and run away? In the Northeast, the summer of 2015 seemed to last forever–right through until winter, in fact; we didn’t have much of one, and it never got very cold except for a couple of isolated days at a time (I remember going to the aquarium on January 10 and all I needed to wear was a sweatshirt). Unfortunately, the mild weather allowed our area to be over run with mice in the summer of 2016. 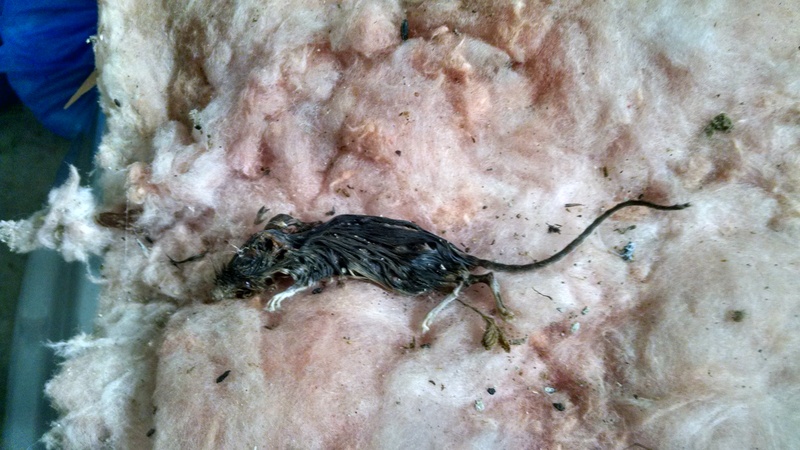 We’d never had mice in our twenty-two year old home–EVER–until this summer. I found this little guy in the basement (I should note, here, that my husband is an exterminator, so it’s likely this guy succumbed to some poison). What’s interesting about this corpse: the striated decay pattern. I’ve never seen anything like that before. My housemate found this in the lower yard (no one goes there; it’s where the septic tank is, but it’s been cleared, so he needs to keep it mowed) in late summer. We think it may be a young or baby groundhog. 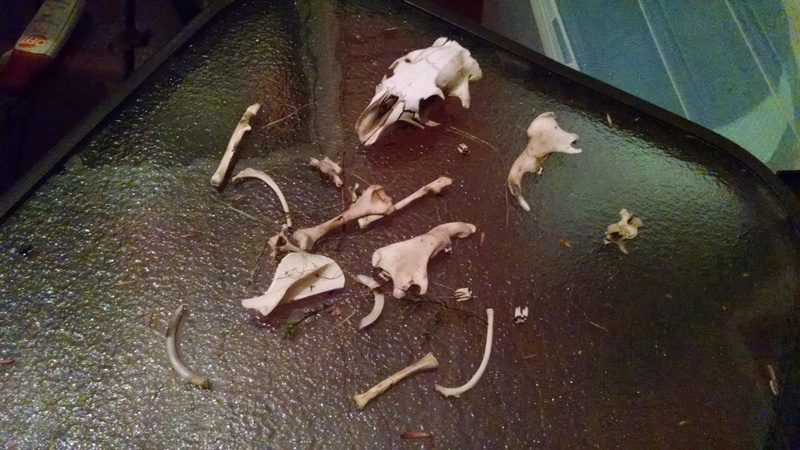 The bones were picked so clean that we suspect the little guy probably passed much earlier in the year.